We had a break from the felling routine in 2009 and did some planting [as before] and some fencing. The fencing was done in two stages… when Stuart was here, in March, we aimed to get the posts in place and the strainers fixed up with the three carry wires attached and strained. The strainers were done as “Colonial” two post, rather than the more usual post and a diagonal. This technique lends itself to rocky soil like ours, where it is difficult to dig a decent post hole to a good depth. I’ve seen the method used quite a lot around here… so it is not a strange thing to see a double header version at a corner or bend, the central post of three being the ‘joint’. And just recently I’ve seen a triple upright, double tensioner version over near Chaumussay. This is the major fence line, the one between the properties. The "Colonial" strainer is in and tensioned and the post line is in place. 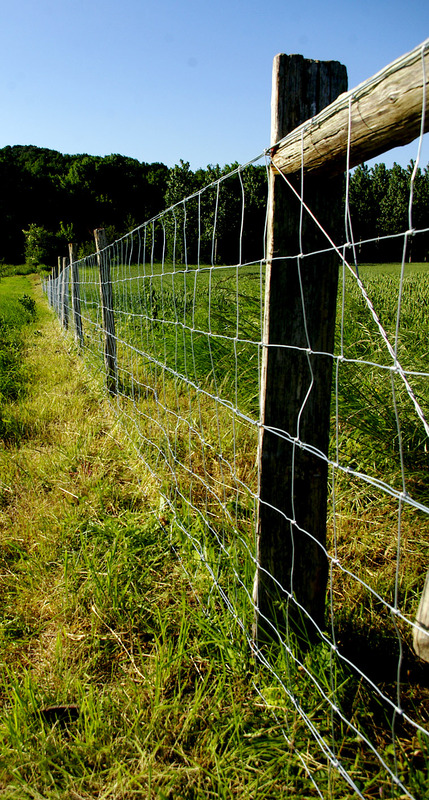 the most difficult part of fencing is getting the line right in the first place! 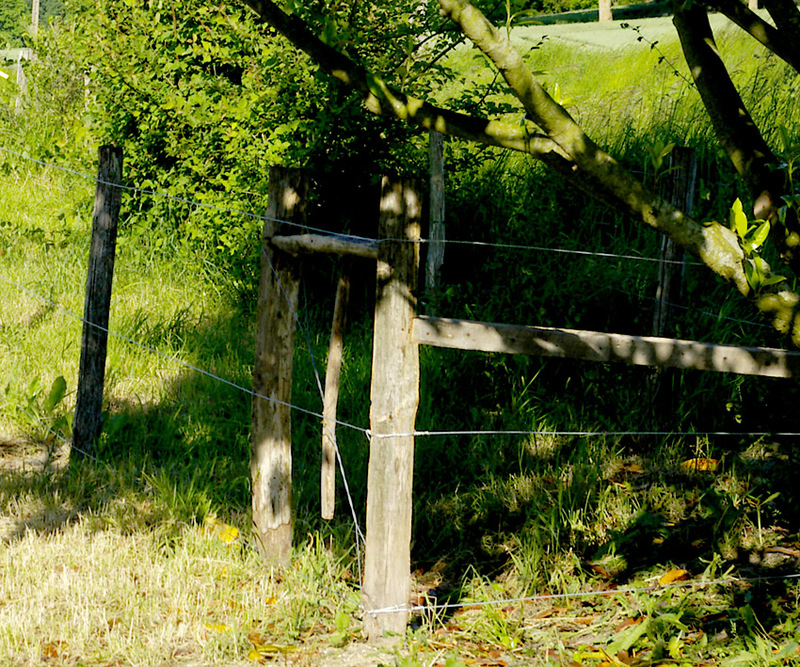 You will see from the picture that a winder is used to tension the frame… when fixing the stock fence in place, you start to strain up the fence at the second post, leaving the piece that covers the strainer frame able to be removed as necessary for re-tensioning the fenceline. All the posts used were reclaimed chestnut ones from other places on the site… mainly from the bank of the bief. Stuart and I managed to get both the lines finished and the straining wires in place without much difficulty… despite using ‘second-hand’ posts. This is a corner of the second fence line, the one by the road. The three strainer wires can be seen quite clearly. but a length of timber performing much the same function on a very short run. 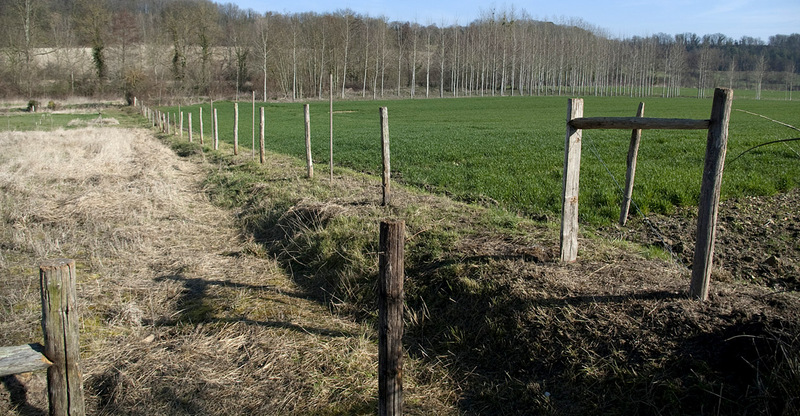 When Pauline and I returned in May, we stapled the stock fencing in place on most of the fence line, leaving just two sections that I will be completing in the next couple of weeks… honest. This entailed rolling out the cattle mesh and crimp-stapling it to the top wire… before going back down the line and doing the same on the other two… trying to hold a 22 kilo roll of cattle mesh upright and unroll it at the same time is no joke… it seems to be very tired and wants to lie down all the time!! But we got there… with much shouting and cussing!! This is the main fence line, once the cattle mesh has been added. but along the next 'rung' up... this allows the mesh to be 'moulded' along the ground. Any bigger irregularities are taken care of with offcuts of mesh wired on and buried.